With the increasing size of high performance computing systems, the expensive communication overhead between processors has become a key factor leading to the performance bottleneck. However, default process-to-processor mapping strategies do not take into account the topology of the interconnection network, and thus the distance spanned by communication messages may be particularly far. In order to enhance the communication locality, we propose a new topology-aware mapping method called TAMM. By generating an accurate description of the communication pattern and network topology, TAMM employs a two-step optimization strategy to obtain an efficient mapping solution for various parallel applications. 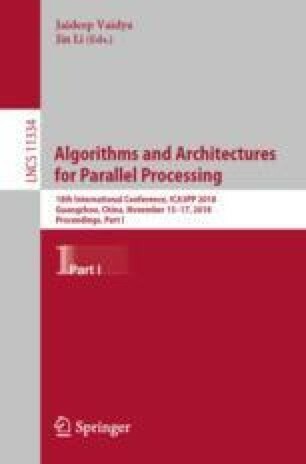 This strategy first extracts an appropriate subset of all idle computing resources on the underlying system and then constructs an optimized one-to-one mapping with a refined iterative algorithm. Experimental results demonstrate that TAMM can effectively improve the communication performance on the Tianhe-2A supercomputer. This research work was supported in part by the National Key Research and Development Program of China (2017YFB0202104), the National Natural Science Foundation of China under Grant No. : 91530324, No. : 91430218, China Postdoctoral Science Foundation (CPSF) Grant No. : 2014M562570, Special Financial Grant from CPSF Grant No. : 2015T81127.